Today is the birthday of Anna Pavlovna (Matveyevna) Pavlova (Анна Павловна (Матвеевна) Павлова), Russian prima ballerina of the late 19th and the early 20th centuries. She was a principal artist of the Imperial Russian Ballet and the Ballets Russes of Sergei Diaghilev. Pavlova is most recognized for the creation of the role The Dying Swan and, with her own company, became the first ballerina to tour ballet around the world. 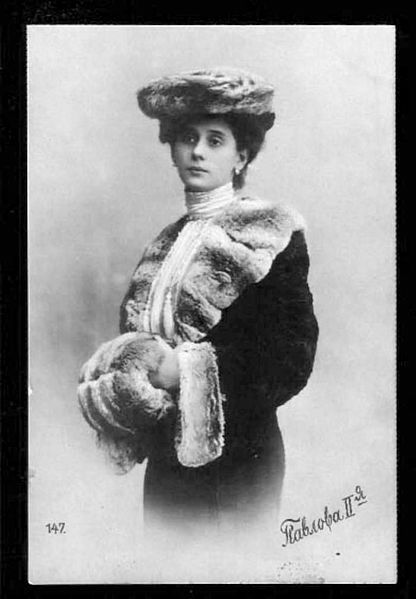 Anna Pavlovna (Matveyevna) Pavlova was born on January 31, 1881 (old style – which is February 12) in Ligovo, Saint Petersburg, to unwed parents. Her mother, Lyubov Feodorovna was a laundress. Some sources, including The Saint Petersburg Gazette, say that her biological father was banker Lazar Polyakov. Her mother’s second husband, Matvey Pavlov, is believed to have adopted her at the age of three, by whom she acquired his last name. Pavlova’s passion for the art of ballet was ignited when her mother took her to a performance of Marius Petipa’s original production of The Sleeping Beauty at the Imperial Maryinsky Theater. The lavish spectacle made an impression on Pavlova. At the age of nine, her mother took her to audition for the renowned Imperial Ballet School. Because of her youth, and what was considered her “sickly” appearance, she was not chosen. In 1891, she was finally accepted at the age of 10. She appeared for the first time on stage in Marius Petipa’s Un conte de fées (A Fairy Tale), which the ballet master staged for the students of the school. Young Pavlova’s years of training were difficult. Classical ballet did not come easily to her. Her severely arched feet, thin ankles, and long limbs clashed with the small and compact body in favor for ballerinas of her time. Her fellow students taunted her with such nicknames as “the broom” and “la petite sauvage” (the little savage). Undeterred, Pavlova trained to improve her technique. She took extra lessons from the noted teachers of the day — Christian Johansson, Pavel Gerdt, Nikolai Legat — and from Enrico Cecchetti, considered the greatest ballet virtuoso of the time and founder of the Cecchetti method, a ballet technique used to this day. In 1898, she entered the classe de perfection of Ekaterina Vazem, former prima ballerina of the Saint Petersburg Imperial Theatres. During her final year at the Imperial Ballet School, she performed many roles with the principal company. 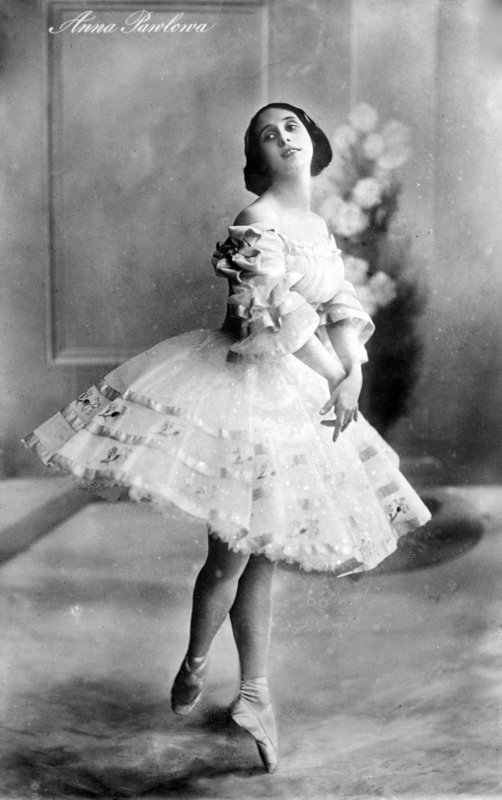 She graduated in 1899 at age 18, chosen to enter the Imperial Ballet a rank ahead of corps de ballet as a coryphée. She made her official début at the Mariinsky Theatre in Pavel Gerdt’s Les Dryades prétendues (The False Dryads). Her performance drew praise from the critics, particularly the great critic and historian Nikolai Bezobrazov. I wish I could have seen her. My students know I love ballet. I’ve already given you the dessert named in her honor. 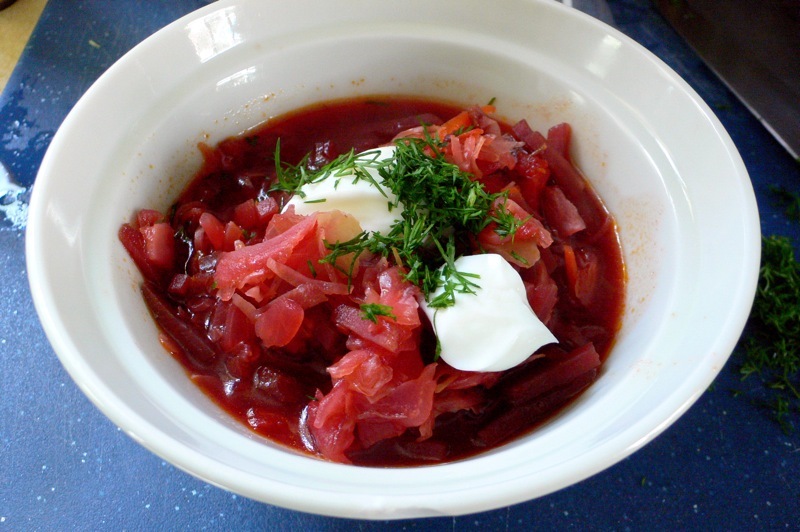 So here’s borscht. Fill a large soup pot with 10 cups of water. Add 2 – 3 beets. Cover and boil for about 1 hour. Once you can smoothly pierce the beets with a butter knife, remove them from the water and set aside to cool. Keep the water. Grate both carrots and dice one onion. Add 4 Tbsp of cooking oil to the skillet and sauté the vegetables until they are soft (7-10 minutes). Stir in ketchup when they are almost done cooking. Thinly shred ½ a cabbage and add it to the pot when the potatoes are half way done. Add 6 cups of chicken broth, lemon juice, pepper, bay leaves and the can of kidney beans (with their juice) to the pot. Add the sautéed carrots and onion to the pot along with chopped dill. Dance as if your life depended on it. (It does).